Synthetic soil fumigants such as chloropicrin and 1,3-D are used by some commercial growers to control soilborne pathogens, weeds and nematodes prior to planting strawberries, onions, tomatoes, eggplant, peppers and spinach. These fumigants and all other biocidal products with the potential to harm the environment and human health are highly-regulated by the federal Environmental Protection Agency, the state Department of Pesticide Regulation, and county agricultural commissioner's offices. Assessment of permeability of commercial tarps under a variety of cultural practices and in various soil and environmental conditions is expected to lead to better understanding of maximizing fumigant effectiveness while reducing emissions. Growing in substrate (soil-less culture) allows growers to produce crops with minimal plant disease and weeds without using fumigants. 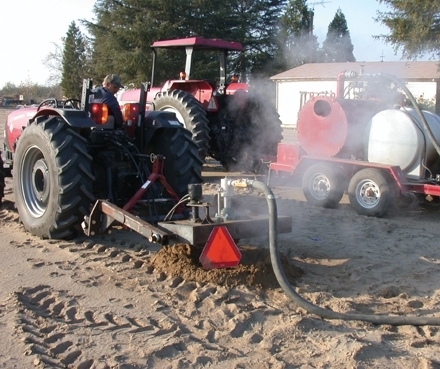 Heating soil using steam is a successful way to disinfest it. However, the process to generate steam in a field can be slow and very expensive. Researchers are working to find ways to improve speed while reducing cost. Most organisms, including plant pathogens, cannot survive without oxygen. Researchers are investigating an organic method to create anaerobic (oxygen-free) conditions to treat soil before planting. Planting mustard as a cover crop can provide many positive benefits, one of which is allelochemical compounds. These compounds found in mustard are similar to those found in fumigants. Current research shows it is possible to use this green biomass to prepare fields for production. More environmentally-responsible research from Dr. Daugovish can be found here. Injecting steam may be one way to disinfest soil without chemical fumigants.